Role: Controller. As a warrior, you distinguish yourself not only by martial skill and fighting ability, but also of your capability to control the battlefield. 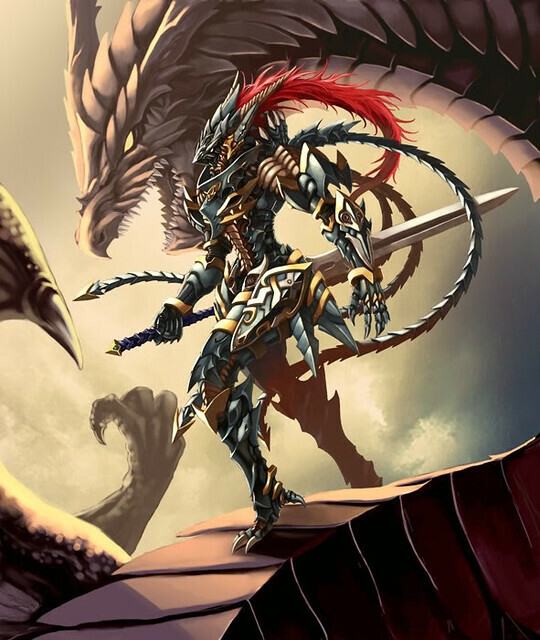 Dragoons are martial warriors, yet they rely heavily on their own natural abilities in combat. Dragoons control the battlefield conditions by strategic placement near their allies, and by using their breath attacks, which allow them to target large areas. Rather than rely on magic or divine implements, Dragoons rely on their ability to breathe the elements, including fire, cold, lighting, poison and acid. They can move quickly across the battlefield, with no penalty to their speed for wearing heavy armor and a +2 bonus to speed. They charge enemies as an immediate interrupt that would attack their allies, and quickly breath empowered breath attacks to enhance their own powers. Unlike many other classes, they have encounter abilities they can use multiple times, relying on both charges and their breath attacks. They are one of the few martial controllers, and seek to control the battlefield in unique ways. They do above average damage and have above average defenses, yet do not equal that of a striker or defender. They are fearsome competitors, difficult to rival in raw versatility and ability. They focus on area of effect abilities and penalties to their enemies. Dragoon's qualify as Dragonborn for the purpose of meeting racial prerequisites, such as feats or paragon paths. When choosing Dragonborn paragon paths and other relevant powers, they can choose to use one of any damage type, instead of one chosen at character creation. Strength should be your primary ability. As almost all of your powers utilize strength for the attack and damage roll, strength is your most important ability. Your second most important ability is your wisdom modifier, which boosts your special fighter abilities. Fighters are as much about controlling the battlefield as they are about protecting their allies. While you have naturally high defenses, it's always a good idea to invest in better defenses, such as with improved defenses or toughness. As all of your attacks are damaged based, it's recommended that you pick up weapon proficiency feats in superior weapons, as well as potentially damage boosting feats. While you will likely never be as close as a striker, with feats that allow you to add wisdom to your opportunity attacks particularly important. As you qualify for Dragonborn feats, it is wise to pick up feats for this racial background. Enlarged dragonbreath is recommended, as it will make your dragon breath ability capable of covering a 5 x 5 area, instead of a 3 x 3. Other abilities can be used to boost your damage or have other effects. Paragon paths can be used as well; when using Dragon breath related abilities, you can choose with damage type you use with the attacks, rather than one you chose at character creation. As many of your powers are dependent on charging, it is recommended that you gain some bonuses to charging, such as with Fast Runner. As you are a heavy armor dependent class with secondary abilities that do not boost lightly armored defenses (such as dexterity or intelligence), you should start with the highest armor you can, or scale. Scale is extremely important, as it provides bonuses to speed and AC as well as removes your speed penalty. Further, you should choose a two-handed weapon, since you gain a shield bonus equal to a shield and do more damage with the weapon. As all of your breath attacks are dependent on your weapon proficiency, it is wise to choose a weapon with a high proficiency, such as a sword or greatspear. With the greatspear, you will have a further range, but with weapons such as the fullblade you will have higher damage. You must choose the "Dragoon" fighter path to gain all of the following features. You cannot simply choose some of the features as new additions to the fighter, but instead are given these powers by choosing the path. You use all of the same fighter encounter, utility and daily powers, but must use the described class features. You can choose at-will powers from the fighter class in addition to the newer at-wills presented. It's important to bear in mind that some fighter abilities allow you to mark or focus on defender oriented abilities; for encounter and daily purposes, you can mark, which gives you secondary defender abilities, much like how the paladin has secondary healing abilities. You are of course still predominately a controller. Combat Challenge functions similarly to regular fighters, however it works with a few changes. The power no longer marks. Although for functions of feats, prerequisites, paragon paths and other abilities it functions as the same, instead the text reads only as "Whenever an enemy that is adjacent to you shifts or makes an attack that does not include you, you can make a melee basic attack against that enemy as an immediate interrupt." In this way you still have access to fighter modifications and other abilities, but it does not allow for you to mark targets. For the purposes of consider a target effected by Combat Challenge, you only need to target it (but the target is still not marked). For the purpose of meeting prerequisites, the "Fighter Weapon Talent" functions as the same. However, the text and benefit is replaced with "When using weapons, you gain a +1 hit to attack rolls." For the purposes of meeting prerequisites, such as for feats or paragon paths, you qualify as Dragonborn. Further, you gain a +2 bonus to saving throws. In addition to this, whenever you are wearing scale armor you gain a +2 shield bonus to AC and reflex, ignore the speed penalty to heavy armor, and gain a +2 bonus to speed. You gain the racial power "Dragon Breath". For the purposes of meeting prerequisites, such as feats, the power functions as the same. However, the power is replaced with the following. In addition, all "Dragon Breath" related powers can add the proficiency bonus of a weapon you are wielding to attack rolls. You can use the power 3 times per encounter. Hit: 1d6 + Highest ability modifier damage. This increases to 2d6 at level 11, and 3d6 at level 21. In addition, based on the damage type you choose, you cause an additional ongoing effect that a save can end. Cold: The target is immobilized and grants combat advantage to allies. Fire: The target takes ongoing damage equal to your highest ability modifier. Lightning: The target is pushed two squares, knocked prone and deafened. Poison:The target takes a -2 penalty to defenses and grants combat advantage to allies. Special:You can choose to change the damage type of the attack before the attack, however you can only choose one damage type (cold, fire, lighting, acid, and poison). The power's range can be close blast 3, Area Burst 1 (Ranged 10), or Close Burst 1. In addition, you can use the ability 3 times per encounter. Dragoon's are known for miraculous feats of flight, flying across the battlefield and engaging enemies on the farthest reaches of the battle. You can charge an enemy as an immediate interrupt on an attack of your ally, and gain the "Hishou" power. You can use the ability 3 times per encounter. Trigger: A a creature within range of charging targets an ally with an attack. Effect: You charge target. During the charge, you can ignore opportunity attacks, difficult terrain, and your movement qualifies as overland flight (you must land at the end of the movement). If the attack is successful, then the attack on the ally is interrupted. Special: You can use this ability 3 times per encounter. You strike with your breath attack, weaker than your more powerful abilities, yet potent nonetheless. Hit: 1d8 + Strength and the target takes a -1 penalty to all attack rolls until the end of your next turn. You hurl your breath at your opponent, keen to target them at a range. Hit: 1d6 + Strength and the target takes a -1 penalty to all defenses until the end of your next turn. You exhale your breath uncontrollably, expelling it in every direction. Hit: 1d10 + Strength and you push the target 1 square. You attack the target with tremendous force, sure to at least do some damage. Hit: 1[W] + Strength and an enemy adjacent to you takes damage equal to your Strength modifier. Miss: On a miss, you deal damage equal to your strength modifier. You lunge towards the enemy, keen to take them off balance by your sudden and aggressive attack. Hit: 1[W] + Strength and the target is slowed. Special: The reach of your attack can be instead replaced by your wisdom modifier (minimum 1). You attack in rapid fury, striking the target as many times as you can.